The Pakistan Army had earlier released a "confessional video" of Jadhav, in which he said he was a serving Indian Navy officer. 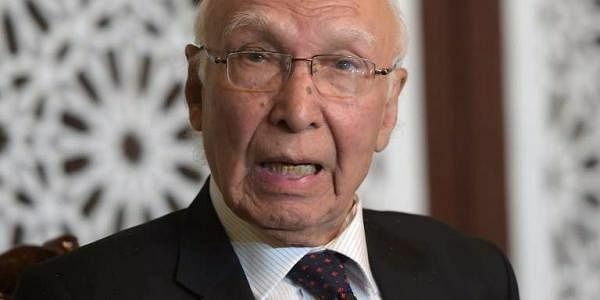 ISLAMABAD: The Pakistan government is not considering to extradite Indian "spy" Kulbhushan Jadhav, who was arrested for allegedly being involved in "subversive activities" in Pakistan, Foreign Affairs Advisor Sartaj Aziz told the Senate on Friday. Jadhav was reportedly arrested in Balochistan after entering the country from Iran. According to Aziz, an FIR has been registered against the alleged Indian agent, Dawn online reported. When asked if the government was planning to give the same 'red carpet' treatment to Jadhav, which they gave to CIA contractor Raymond Davis, Aziz explained: "It has never been said that there was any lack of evidence against him." "We have prepared an FIR and a case to prosecute the Indian state actor for (his) involvement in subversive and terrorist activities in Pakistan," Aziz told the House during Question Hour. Aziz said Islamabad has shared a dossier with UN Secretary General Antonio Guterres on New Delhi's involvement in internal affairs of Pakistan and in subversive and terrorist activities in the country. "This dossier includes details about Kulbashan Jadhav and his activities." "This is very delicate and sensitive issue and requires detailed preparations and home work as it relates to direct or indirect involvement of Indian state actor in subversive and terrorist activities in Pakistan." He said Pakistan's view point on this issue is being accepted internationally and the government has also sent a list of questions to the Indian government on this matter. Meanwhile, Pakistan Peoples Party (PPP) Senator Aitzaz Ahsan said: "I had announced that if Prime Minister Nawaz Sharif mentions Jadhav's name in his speech, I will donate Rs 50,000 to Pakistan Association of the Blind." When asked if Sharif had spoken about Jadhav, Aziz said: "When the time is appropriate, the Prime Minister will speak about him."